But all this is prologue. Rich made one argument that I strongly disagree with - that for a journal, the imprimatur provided by a journal is still valuable and needed. "Any scientist who has been an active participant in scientific publication as an author, reviewer, and consumer recognizes that the only remaining value added by scientific publishers today is imprimatur. Imprimatur is the implied endorsement received by authors who publish in certain scientific journals, particularly in those that earned a high level of prestige during the pre-digital period of publication scarcity." I disagree. The value of a "prestigious" journal is not the prestige, it is something far more valuable that we all are implicitly aware of, something that journal editors provide, something that gives the journal it's prestige and that is curation - deciding what is and isn't important. It is this step that provides the ultimate value of a journal. Without appropriate curation (lots more on that in a minute), the journal becomes a meaningless pile of data. Being peer-reviewed, it is accurate (more-or-less) but without guideposts. As I said, we are all aware of this already, but just not explicitly. When that prestigious journal brag about how few papers they accept, what the journal really bragging about how much they curate. They are able to make great decisions about what their readers want to see and what they don't want to see. Effective curation over time leads to imprimatur. Without effective curation, your journal has papers which may or may not be of great value, but a landmark article in the Upper Midwest Journal of Photochemical Interactions in Northern Blots will never give that journal any prestige. To me, if I was a journal that wanted to convince people that they should pay for it in this age when "information just want to be free" is the mantra, I would sell curation hard, very hard. All the other services that journals used to supply are now easily duplicated by all the disruptive technology available. But curation, and the ability to perform it well, is something valuable that still remains. It is what distinguishes Angewandte Chemie from Tetrahedron Letters. It needs to be recognized and it is worth paying for. Let me go back to the subject of curation in a broader context. As long as there has been mass media, there has been curation. It has never been possible for a mass media source to publish/broadcast everything so choices were made as to what was and wasn't going to be put out for consumption. In the past, those choices were made by a small group of people. If you were unhappy about their choices, there was little you could do. With the internet, curation initially appeared to have died, as everyone could have access to everything. But even with all those choices, mainstream media sites still remain popular destinations because of their ability to effectively curate. As with very selective journals, when the New York Times makes the statement "All the News That's Fit to Print", they are referring to their curation abilities. Curation will never disappear. I would suggest that there is a basic human need for it. If it is lacking, someone, somewhere will create it. It is also fairly obvious that it is needed now more than ever. The information that we have access (or potential) access to is greater than ever before, and becoming greater with each passing day. Some of the most visited websites - the Drudge Report is a terrific example - are nothing more than curation sites. Matt Drudge decides what to link to on his page and doesn't provide any explicit editorial comment other than the headline for the link, and yet his sites has millions of hits per day because he has a great sense of what people want to see. If he ever loses this sense, his page will drop in its importance. 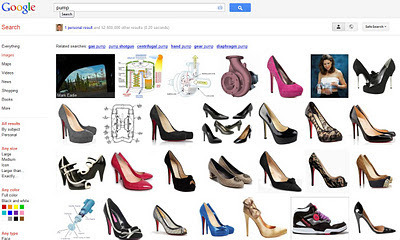 Curation has also started appearing in our search engines. This is certainly a new concept, one that has never before occurred in our history. Early search engines on the Internet gave a haystack of results with little effort to prioritize the results. The searcher was expected to find the good from the bad. Google became a dominant player because it was able to prioritize webpages - decide what was more important. But they didn't stop there. It is now becoming more well known that Google will further alter search results based on information it has gathered about you from past searches. 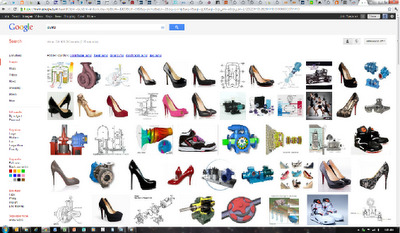 A recent example of this was seen in the engineering sub-reddit, where an engineer posted a screenshot of what the Google image search showed for "pump" - quite a few high heeled shoes, more than he would have liked. Here's what an identical search for me produced. Now when we find books via computer search (either from libraries or Amazon), serendipitous outcomes are pretty much impossible. Even if you misspell a word, the search algorithms will overcome that and give you the "intended" result. 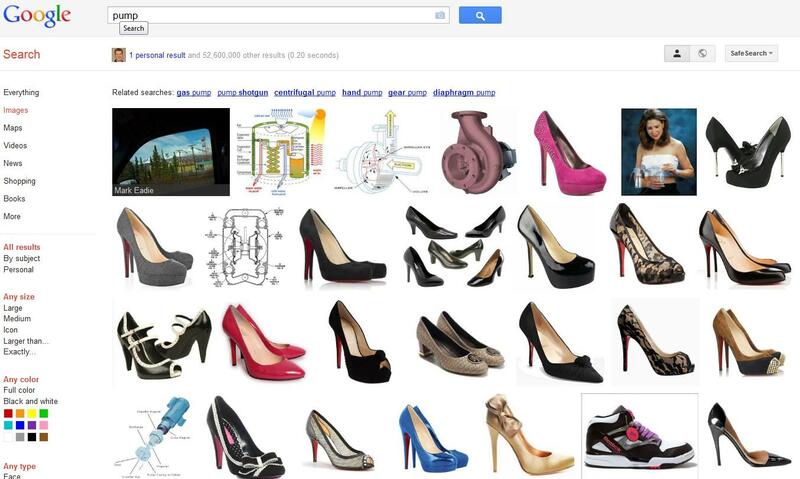 Can you have serendipitous search results with Google? A decade ago when their algorithms weren't so refined, you could have. Now you can't. There is no "random search" option, no "show me something new" option, no "tickle my brain" option. 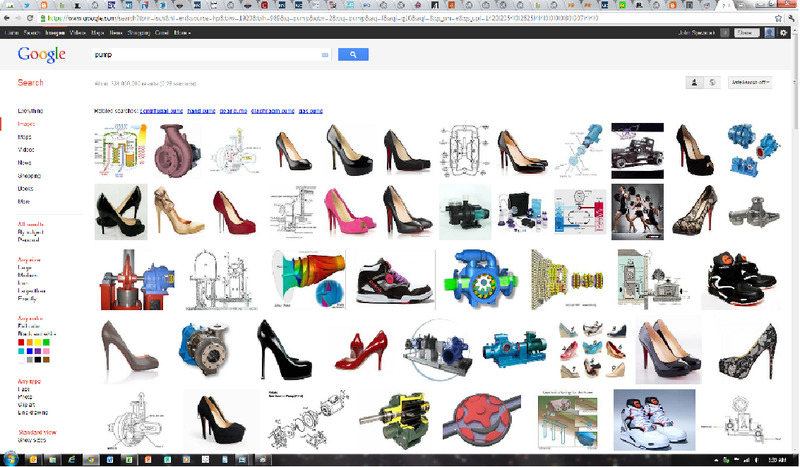 And this is not to pick on just Google. Twitter will only show you what you have indicated that you want to see. Same with Facebook and endless other sites. Serendipitous results can be found, but ironically, you have to work at it. Reddit/Digg/StumbleUpon and similar sites are places where people send links that they think are interesting. Their main pages provide the top results, so you will certainly see something new, although it will be what is most popular, a description that makes me wonder about humanity's fate at times. Curation and serendipity are opposite sides of the coin, but paradoxically, we need both. Curation seems to have the upper hand at present and that trend will continue for the foreseeable futher, while serendipity is being forced to the side, something that we have to struggle to keep alive. As a last comment, the blog entry by Ethan Zuckerman, Desperately Seeking Serendipity is a wonderful read about serendipity in cities and other geophysical structures. It is a long article, but well worth the time. Mind-opening.